Confession: I have a mild phobia of heights. I’m fine with going up the British Airways i360, with flying – heck, I’ll even get hurled out of an aeroplane at 14,000ft if there’s a good view coming down and someone else is in charge of the parachute. But the ones that depend on upper-body strength (something that I am seriously lacking) if things all go Pete Tong – now those are the ones I have issues with. With this in mind, it makes total sense that I would find myself and a colleague taking part in one of High Sports Brighton’s new Introduction to Climbing courses, right? 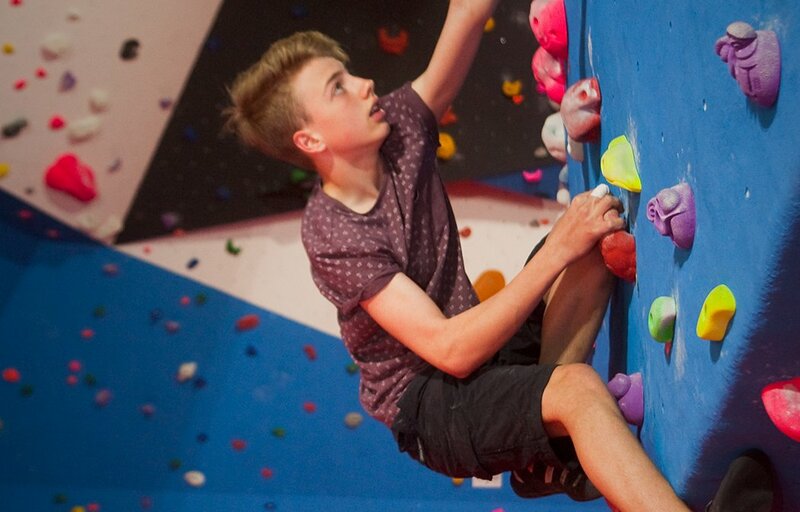 Situated at Withdean Sports Complex, High Sports has it all: it’s the largest climbing facility in the south east region, and boasts two floors of bouldering, 50+ roped lines, 13-metre lead walls, auto-belays, speed walls, and clip-and-climb for more advanced climbers. This wasn’t my first attempt at climbing – a recent trip bouldering reduced me to a shaky mess (though I should mention this is by no means a reflection of the facility, and merely just a result of my phobia) – but I was determined to give it another go. I’m placed in the hands of skilled, five-year climber George, who fits me with my harness and ropes me up ready for my first belay climb. Before long, I’m off, climbing the wall reasonably effortlessly. But it’s when I get to the top that I start to crack – after all, getting down again is the worst part. Fortunately, I have George to guide me from the ground below, who patiently reasons with me until I feel brave enough to let go. Before long, I’m floating down the wall to join him again at the foot of the climb. Phew. Following my momentous wobble, George takes some time with me to explain the mechanics behind the belay. I find learning the technical side of the centre helps rationalise my thinking, and am soon set for the next round of climbs. But first, it’s my colleague’s turn. Not one to suffer from the same shortcomings, he shoots up the climbs with aplomb, choosing the more challenging routes as the session progresses. He hits a struggle on one of the climbs around two thirds of the way up when he can’t find a place for his footing, at which point George (who set some of the routes himself) calls up to help with his coordination. We try out the bouldering, training equipment and auto-belays too – and I make a mental note to return for a speed wall when I feel confident enough (ever the competitior). The great thing about High Sports is that it has a variety of routes suited to a wide range of abilities, from complete beginners (me) to those wanting much more of a challenge. While I still wasn’t racing down the wall when the time came for my final climb, I felt much more at ease second time around, and strongly urge anyone with an interest in climbing to take advantage of High Sports’ Introduction to Climbing sessions. Following an initial cost of £10 for the session, climbers are then rewarded a discount on further sessions with 50% off their first 30-day pass – so a full, unlimited month of climbing need only cost £40.85 – bargain! High Sports Brighton’s Introduction to Climbing sessions cost £10, and can be booked on 0345 363 1177. Previous articleWhat Will Student Accommodation Look Like in the Future?